Annie this piece is so powerful. 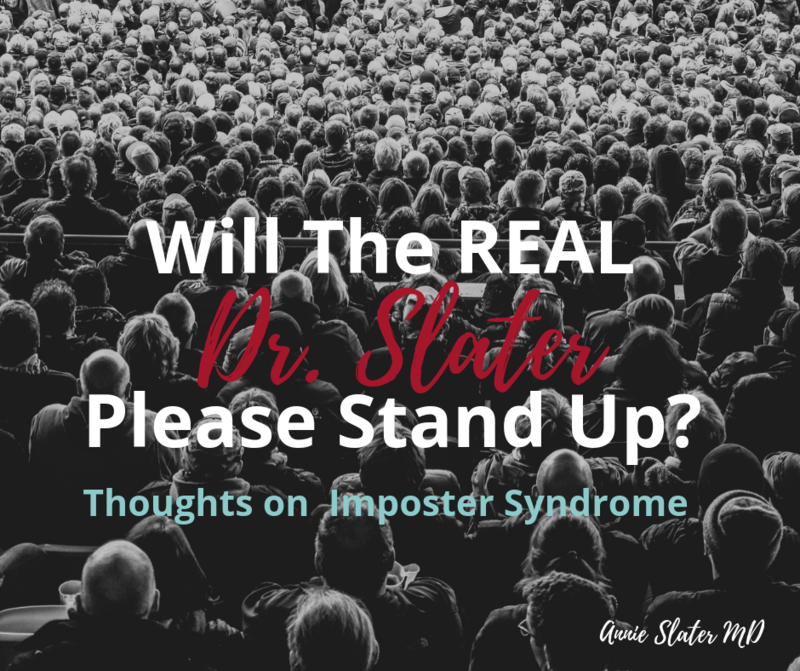 I never saw this “imposter syndrome” in you. You really hid that from me so I guess that means you were the ultimate imposter! I always have been so proud of you and all your accomplishments. You are a super mom, loving daughter and caring wife. I know you are an outstanding physician. I love that now you are able to become so vulnerable with this blog! Great reflection Annie. My guess is that the vast majority of folk experience “imposter syndrome.” The more demanding the schooling/career the more folk experience it. I recall some of the same feelings in my first year of seminary. I was ready to drop out & seek another career…but mom said to finish the quarter since we’d already paid for the classes. Wise decision! Probably our anxieties about our insecurities began at birth when we were surrounded by much larger people who could do a lot more than we could. JP is in those formative years where you, Jim & family can do all we can to minimize the depth of him growing up with imposter syndrome. Every now and then, when I’m discussing treatment options with a family and they are insanely intent on my words—I think–heavens…they are taking every word as Gospel….but is it?? Am I right? Do I have all the facts correct? That is when I feel like I’m an imposter; and will then go read up on the subject just to make sure I really did know what I was talking about. Not being selected for a couple of jobs, in which I was very well qualified, also made me wonder if people saw me as an imposter (or…was it age related??? did they think I couldn’t do the job–aka imposter–due to my age?). BUT…I also think this is a normal human trait–if one is truly honest with oneself. And…..it does make one a bit humble which isn’t a bad thing; and I find I am more willing to admit I don’t know something–than fiddle my way through it. Annie, thanks. Your physician peers are probably nodding in agreement all the way through this piece. As “the professions” become more gender balanced and younger women have more older women on which to model themselves, I hope the imposter feelings become fewer. Bob is right, too, about the absolute importance of a parent’s role in shaping a child’s sense of worth – not self-esteem but worth and belonging in his family. Believe it or not, you survived the East coast because of the love of your West coast family ❤️ (and a lotta hard work). Imagine how competent you’re going to feel after 20 years and two children!! This piece is great. I think that once professionals open up about their own vulnerabilities and difficulties, we can start shedding light on the issues holding us back, often leading to burnout. Also, it’s just so ‘human’ to talk about our imposter syndrome and I honestly feel that all of us have experienced it, in one form or another, in our lifetime. Opening up about it, and reading others do it, too, is simply a breath of fresh air. Thank you for linking back to my own piece on this important issue. Thanks Dana for being so open to talk about your own imposter syndrome. I think you are so right, the more we talk about it, the more others can feel more ‘normal’ in their own feelings of insecurity. The connection to burnout is also a very real but often undiscussed phenomenon. I appreciate your insights!